Instant Pot Pressure Cooker Rice Pudding w/cinnamon and raisins is smooth and creamy. The Demerara Sugar gives a wonderful sweetness without a cloying taste. It’s under 15 minutes in your pressure cooker. Instant Pot Rice Pudding. One of my husband’s favorite desserts is rice pudding. He loves it with cinnamon and raisins, so, that is how I make it for him. 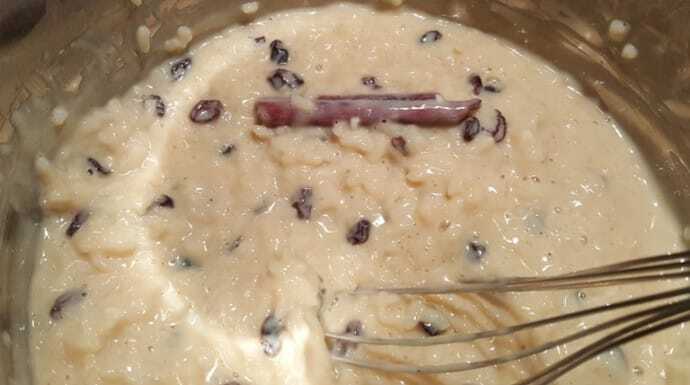 This Instant Pot Pressure Cooker Rice Pudding with cinnamon and raisins is inspired by my husband’s favorite rice pudding recipe his mom used to make for him. I used to make it in our Rice Cooker and when we got our first Pressure Cooker, which is a Wolfgang Puck, converted it to the Instant Pot and Pressure Cooker. It is so easy to make in the Instant Pot and Pressure Cooker, you won’t believe it. I’ve gotten a bit carried away with making rice pudding. It’s just kind of fun to make, really. Hehehehehehe. My Pressure Cooker Creamy Coconut Rice Pudding is loaded with several coconut flavors. My Piña Colada Rice Pudding is a bit naughty, as the pineapple is soaked in rum. You will feel like you are on vacation in the tropics. There are not many ingredients and can have this ready in under 30 minutes. What is the Best Rice for Rice Pudding? I find that Arborio Rice rice makes a very creamy Instant Pot Pressure Cooker Rice Pudding. 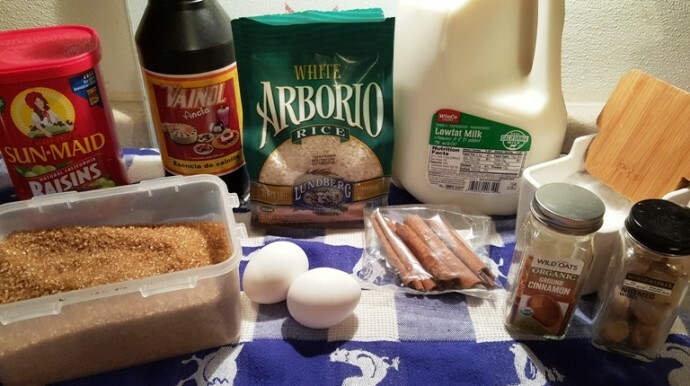 A short grain rice can be used as well, but you may need a bit extra milk an extra minute of cooking to make it as creamy as arborio. 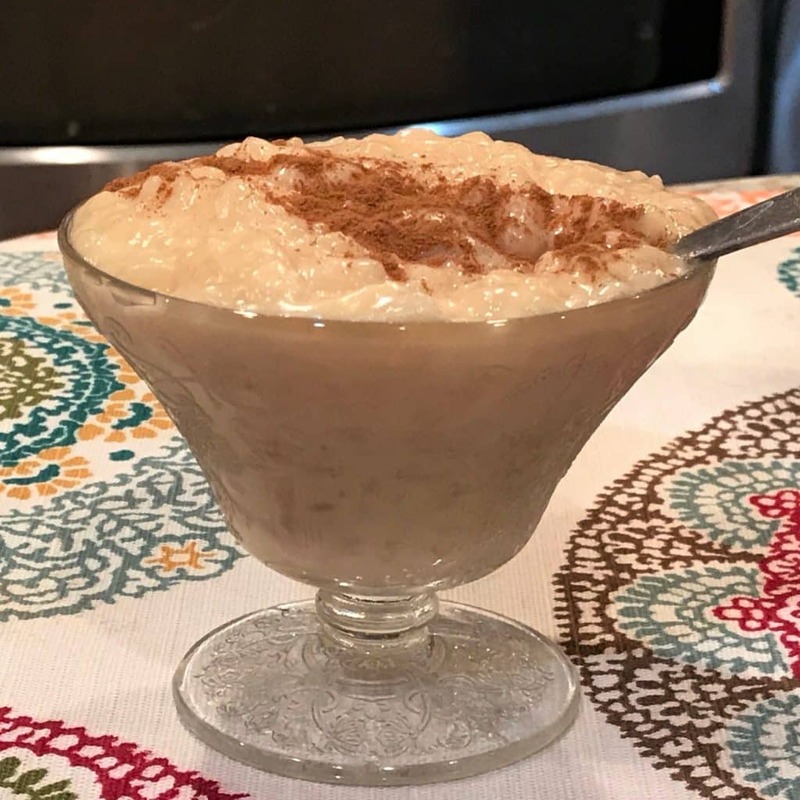 Florida Crystals Demerara Sugar is especially good in Instant Pot Pressure Cooker Rice Pudding as it helps to give the rice pudding a more intense flavor, rather than a cloyingly sweet flavor. Fresh Cinnamon Sticks or ground cinnamon can be used, although it can be left out for plain rice pudding. The Demerara Sugar will give the rice pudding a bit of a creamy color, rather than stark white. How to Make Instant Pot Rice Pudding. 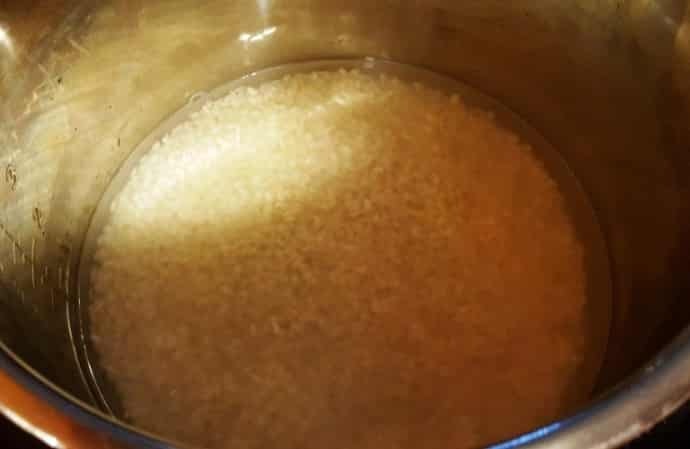 Rice, sugar and water are first cooked in the Instant Pot. Fresh eggs and milk are whisked together and slowly combined with the cooked rice. Don’t dirty another cup. Since most of the milk was used in the last step, just crack the eggs right into the measuring cup with the milk. Add the vanilla and whisk together well. You won’t believe how easy this is to make. Slowly pour the egg mixture into Pressure Cooker cooking pot, stirring as you go. Select the Sauté or Browning function and allow pudding to come to a slow boil, stirring constantly. Continue to whisk for just one minute. 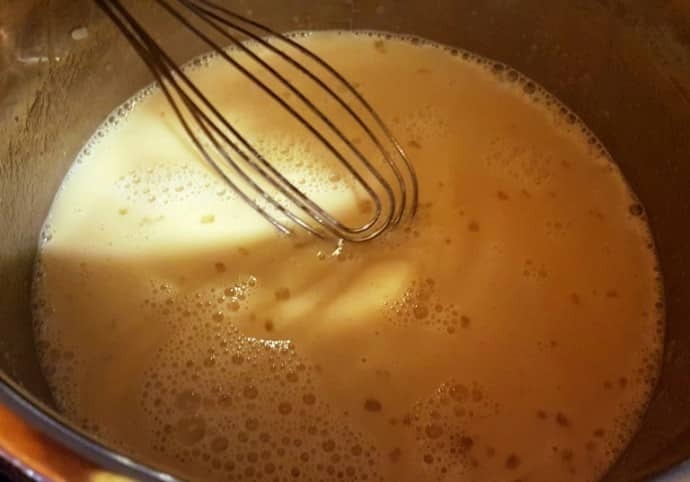 I like to use my Rosle Flat Whisk (if you haven’t noticed by now) to make sure the eggs and rice mix together evenly and without clumps, while the pudding is coming to a boil. When the pudding starts to a very soft boil, continue whisking for one more minute. Remove the pudding from the Pressure Cooker and continue to mix for another minute. If using raisins, add them in here and incorporate them into the pudding. Mixed dried fruit would be fabulous in the Rice Pudding too! The pudding will thicken as it cools, so don’t be alarmed at the consistency. Garnish with Perfect Homemade Whipped Cream and sprinkle of cinnamon powder, if desired. Don’t forget to check out my Pressure Cooker Creamy Coconut Rice Pudding and my Piña Colada Rice Pudding. Lock the lid and close Pressure Valve. Cook on High Pressure for 4 minutes. When Beep sounds, allow a 10 minute Natural Pressure Release and then do a Quick Release to remove any remaining pressure. 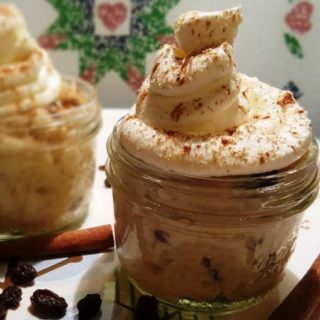 PIN this Pressure Cooker Easy Cinnamon Raisin Rice Pudding! I just got an instant pot for Christmas and have been looking for recipes. On a whim, I made this for dinner guests we had tonight. Everyone (except my ridiculously picky kids) loved it. Thanks for the great recipe! Looking forward to trying your coconut variation. Is demerara sugar similar to sucanot? More similar to light brown sugar. Shelly, I used Truvia and it turned out great. My husband is diabetic. I wondered if it’d turn out okay & it did! 🙂 I used 12 small packages which is 2 Tsp. in each package. 24 Tsp. = 1/2 C. The recipe was a hit with my husband and 3 of my friends. YUM!!! Which of these cups are 6 oz rice cups and which are regular 8 oz cups? I just started making this and realized I didn’t know! Another score Jill, I don’t think I will buy the gross stuff from the store again. Thank you. So you change the cool time if you double the recipe? When does the rest of the milk (1/2C) go in? I just decided to dump it in with the 2 C as I was in the midst when I discovered this. Love your site. Great help to me. I love coconut but didn’t have all the ingredients for your coconut version so just subbed coconut milk for the milk here (the kind from the dairy section not the canned kind) and it turned out great! Is there something that I can subsistute the eggs for? This is fantastic! Served it warm and it is really tasty. I did just use regular white rice and worked fine. Thanks! I can not find Arborio rice in our small town but I do have Basmati and Jasmine rice. Could I substitute either of these. If I can substitute, would I need to change anything else with the recipe? Is there a way to make this with coconut milk? My husband is lactose intolerant. Thank you! Hey, Old Girl is it 2 1/2 cups of milk as listed on the ingredients or 2 cups of milk as listed in the instructions? 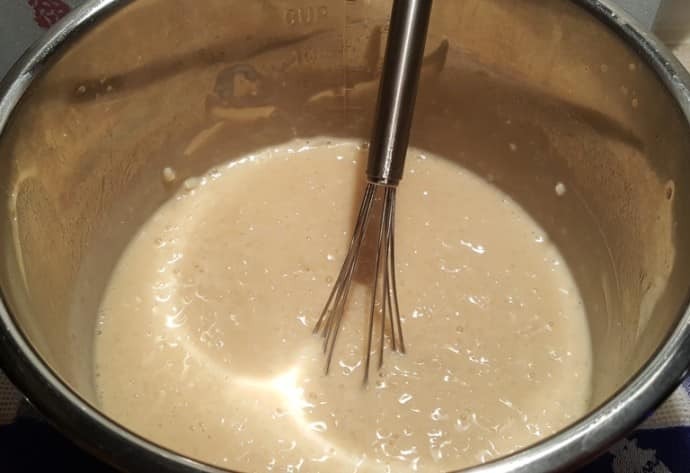 She says clearly in step 4: Add the eggs and vanilla into the measuring cup with the remaining milk and whisk well to combine. This was one of my first instant pot meals. My husband said it was one of the best rice puddings he has ever had! It was fantastic. The only change I would make would be to add half a tablespoon or so of ground cinnamon when you mix in the eggs and vanilla. We didn’t top it with whipped cream, it didn’t need it! We just added a little cinnamon on top and it was perfect. Consistency was perfection, I used whole milk. Thanks for a great recipe! First time makig rice pudding, thanks gor such a great and easy recipe! Yummy!